Last Sunday at Sanctuary Angel Gallery and Healing Centre this rainbow appeared as we were sitting on the couch relaxing. I have never before seen such incredible colours. 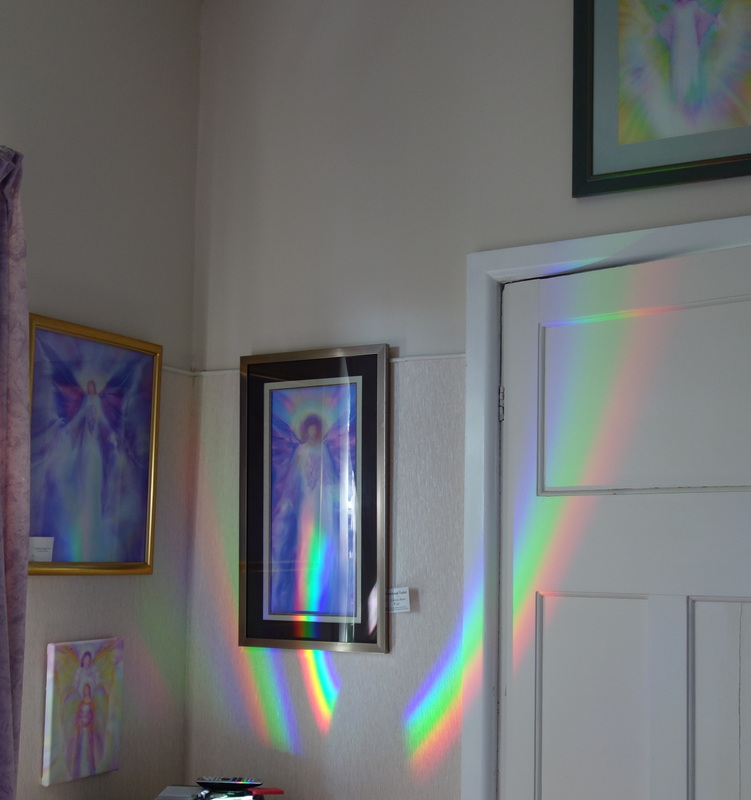 The rainbow slowly moved up the body of Archangel Raphael, and then up the wall toward the painting of Archangel Gabriel. I could feel the healing energy of the Angels sending us a message that they are always with us, ready to help and guide us through our difficulties. We all felt very blessed to have witnessed this! Come and feel their presence. Surround your self with beauty. Sanctuary Angel Art Gallery offers affordable, uplifting, inspirational Angel Artwork and gifts in an atmosphere of peace and harmony. Sanctuary is not just a gallery, it’s an experience not to be missed! Sanctuary Angel Art Gallery is a Place of Deep Peace and Healing, and is the Home of the Inspirational Angel Paintings of Glenyss Bourne. Sanctuary Angel Gallery is open most days by appointment only. Please let us know when you wish to visit. Phone or preferably text Glenyss on 0438 786 484 or email info@anaheart.com to arrange a time. Groups are welcome. Check our EVENTS page to see what is happening soon. If you cannot visit in person, take a virtual Tour of Sanctuary Angel Gallery or visit my Online Galleries. Sanctuary Angel Gallery has several rooms where you may sit quietly and enjoy the high vibrational healing energies. This it our special meditation and manifestation room where many have received Angelic guidance. This is our wonderful healing room. If you would like to book in for a Reiki healing please phone Claire 0411 562 548 or email for an appointment. We hold occasional Meditation and Healing workshops here. Check our events page or follow us on Facebook to see what is coming up. Sanctuary Angel Gallery is situated at 2 Spring St Frankston, Victoria, Australia. We are located just minutes away from Frankston Train Station. It is just a short walk across Beauty Park. Sanctuary Angel Gallery is open most days by appointment only. Please let us know when you wish to visit. Phone or text Glenyss on 0438 786 484 or email to arrange a time. Groups are very welcome, you may like to arrange a special visit by your meditation or healing group. I was amazed as I had never considered doing such a thing. 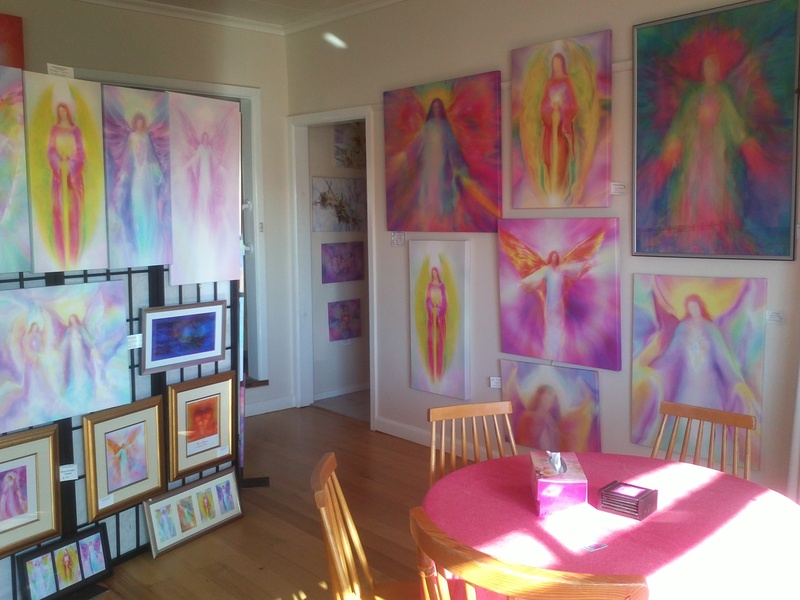 I filled the house with my Angel Paintings and Unconditional love; and worked in energy to lift the vibration. Sanctuary is now a Sacred Space and a powerful place of Peace and Healing. Many people enter and immediately burst into tears. Sensitive people can feel the healing begin as they step inside. 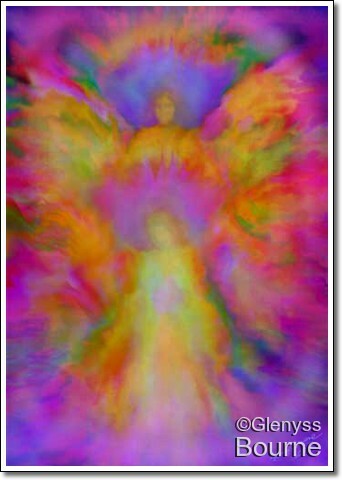 The Angel Paintings open channels to the Higher Realms, helping to bring Inner Peace and Healing and to activate the connection to the Higher Self and to the Angelic Realms. Do not hesitate to contact me if you wish to visit. Email info@anaheart.com for further details. 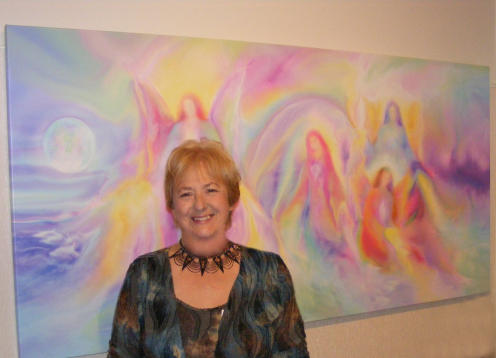 Read what people have written about their experiences with Healing Angel Paintings. Take a relaxing tour of Sanctuary Angel Gallery here. 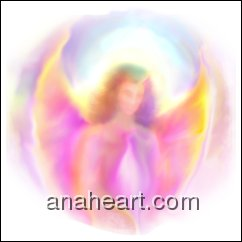 I was guided by the Angels to paint digitally using the light technology of the computer (because this most closely matches the quality of light in the Angelic Realms), there is only a digital original. This means that the Angel Artwork may be reproduced in different sizes on paper or on canvas. Each print is individually hand printed and blessed, signed and dated . The Angelic Artwork is reproduced with archival materials using the Giclee digital printing process and will last for many years. Each large painting comes with its own Certificate of Authenticity. Order paintings here. In late 2007, I was interviewed by Colleen Bate for issue 11 of the magazine Digital Reproduction. A PDF copy of the article can be seen here. Since the beginning of time art has been of spiritual significance and was often thought to have magical properties. Quantum physics explains that we are all pure energy vibrating at different rates, and many medical scientists have documented that both thoughts and feelings have an enormous effect on our overall well being. They now recognize that inspirational art and music have therapeutic effects. Come and experience the angels for yourself and soak up the extraordinary healing energies at Sanctuary Angel Gallery and Healing Centre. Healing is also available by appointment. Visit Glenyss's profile on Pinterest.